Privacy Please! | Faddegon's Nursery, Inc. There is more than one reason to want privacy screening. Even if you love your neighbors you may not love their houses, jungle gyms or noise. Screening may also mean blocking out something in your own yard such as an air conditioning box or tool shed. Or perhaps you need a buffer from road noise or strong winds. If you have a balcony or deck that puts you too close to people or structures there are solutions for that too. Fencing is an immediate fix but fences don’t always solve the problem particularly if unsightliness exists above 6 feet, the height of a typical fence. You may have a fence and wish to soften the look. When imagining plants that would block the view, the first thing you will want to think about is whether or not you need year round privacy. Conifers and evergreens will screen your view all year long while deciduous plants will serve you well if you only need to block the view in the summer months. If noise is also an issue planting conifers or evergreens will help to buffer sound all year. Planting both will give you screening plus more visual interest. 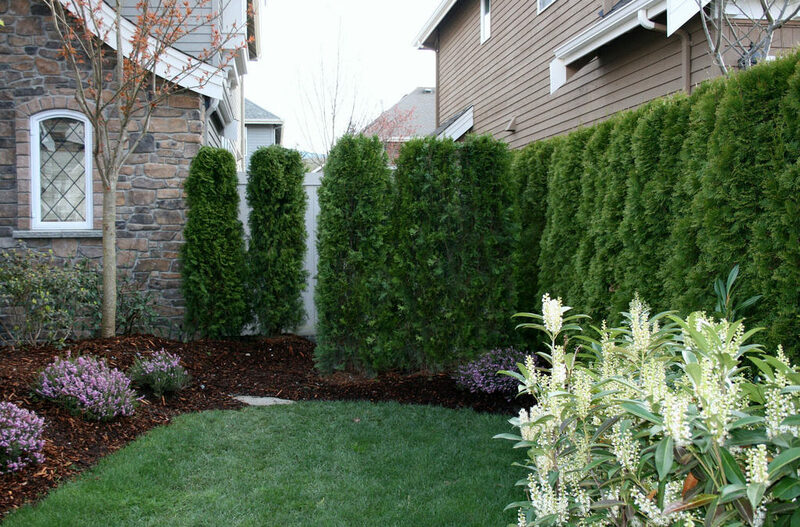 Arborvitae (thuja) – These provide the ultimate in privacy! Tall, comparatively narrow and easily pruned, arborvitae can withstand being planted fairly close to each other. This is the main reason for their prominence as a screening evergreen. But it’s not enough to just buy arborvitaes. The differences between available varieties are significant in size, color, and hardiness. Perhaps less naturally symmetrical than other arborvitaes and also prized for its delicate foliage texture. The foliage has a “twisted” appearance making it a very interesting specimen. Great for a formal look. Mature height: 8 to 10 feet tall, 2-3 feet wide. Light: Full sun. Can tolerate some light shade. ‘Nigra’ distinguishes itself with very dark green foliage which won’t discolor during the winter. It can be easily pruned but can be left untrimmed as well showing off its fan-like foliage . It’s a slow grower adding less than one foot a year. Mature height: 20 to 30 feet tall, 6 to 8 feet wide. ‘Emerald Green’ arborvitaes offer a very nice height for screening the second story of the house next door. Slower growing than ‘Green Giant’, it will add not quite a foot of growth a year. It has a classic pyramidal shape and soft green foliage. Known for keeping its color beautifully through the winter. The aromatic foliage smells great when squeezed! Mature height: 10 to 15 feet tall, 3 to 4 feet wide. Of the arborvitaes ‘Green Giant’ is the fastest growing easily growing 2-3 feet in a year. It is naturally pyramidal in shape. The foliage is very dense. Did you ask for privacy? You’ll have privacy! Mature height: 30 to 50 feet tall. 10 to 12 feet wide. Conifers & Evergreens There are many varieties, but some should be left to grow in their natural state and not pruned or planted too closely together. One by itself may be just right to block the view of a corner or specific focal point. Some varieties of juniper are narrow and tall making them a good choice. ‘Green Mountain’ – It’s a natural choice for hedging and garden structure. Light pruning will emphasize its upright conical shape if desired. ‘Green Mountain’ has a dark green foliage and will keep its color right through the winter. The foliage grows close to the ground making it a good shrub for the back of an area. Mature height: 4 to 5 feet tall, 3 to 4 feet wide. ‘Shamrock’ is a dwarf variety so won’t grow out of control. This broadleaf evergreen has glossy dense foliage that stays through the winter unless exposed to a long period of temps below 0 degrees. Perfect for defining areas of the garden and screening smaller eyesores. Can be lightly pruned in early spring. Mature height: 3 to 4 feet tall, 3 to 4 feet wide. If summer privacy or shade is what you’re looking for you’ll have a host of options. Many beautiful shrubs can grow quite large – some flower and some do not. Hydrangeas, viburnums, and ninebarks offer a variety of colors and textures. ‘Amur River’ Privet – long relied on for large hedging, privet is a fast growing deciduous shrub. Easily trimmed to any size and shape, it’s easy to make privet fit your need. Given free rein, it will create a formidable wall of green. Privet is very hardy, reliable and easily transplanted. A very forgiving shrub in all respects. Mature height: 12-15 feet tall with a spread of 4-8 feet. Light: Full sun to part shadeRose of Sharon – If you want a fast-growing deciduous plant that also flowers Rose of Sharon will suit you. You’ll have lots of big colorful flowers in midsummer ( a range of colors are available) As you look at different varieties you’ll likely see one that grows to the size you need. Easily pruned in early spring, you can shape or trim without worry of losing flowers since they grow on new wood each year. Do you have to prune? No, not necessary if you would rather not. This shrub can be as carefree as you like. Not picky about its soil after established. Mature height: 10 to 20 feet spreading to half the height. Light: Full sunOrnamental Grasses – Some of the perennial grasses can grow to 7 and 8 feet tall and spread to fill in between each other. Although they will primarily work for you in the summer months, they do grow from the ground each year and will be at their best beginning in July and August. Many people also love the look of the dried stalks of fall and winter. Since grasses should be cut down in late winter you can take advantage of the winter interest they offer. Light: Full sunSpirea – spireas are traditional and beautiful cottage garden flowering shrubs. A ‘Vanhoutte’ spirea explodes with long arching branches covered in clusters of tiny white flowers in spring. (There are many varieties of spirea ranging in size, foliage color and flower color). Mature height: from 6 to 8 feet tall spreading to 10-12 feet. Light: Full to part sunHolly ‘Southern Gentleman’ Winterberry – This male holly has dark green thick foliage and produces no berries. It’s most often used to mix with female hollies as pollinators and creating reliable hedging. A native plant in the Eastern United States, ‘Southern Gentleman’ will experience very few problems if any. It has a naturally upright rounded growth habit. It’s also a great solution if you have a damp area. Light: Full to part sun depending on varietyContainer Gardens – Having a deck or balcony affords you a wonderful spot for getting outdoors in the warm weather but sometimes that means being in close proximity to others. Planting large tropical plants in containers can go a long way in providing not only a visual but psychological barrier between you and your neighbor. Look for tropical hibiscus, palms, dracaenas, mandevillas or elephant ears.